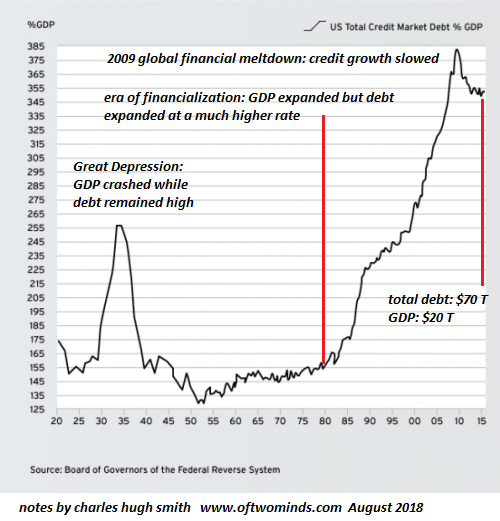 The tiny pause in borrowing circa 2008-09 almost collapsed the global financial system. If this is your idea of a stable, sustainable trajectory, what are you high on? 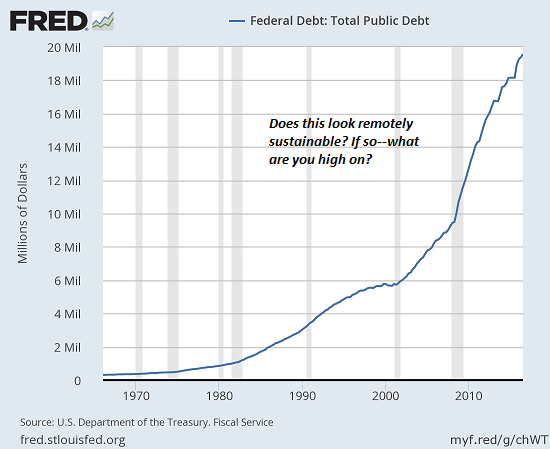 This chart of federal debt is outdated-- federal debt has far exceeded $20 trillion. 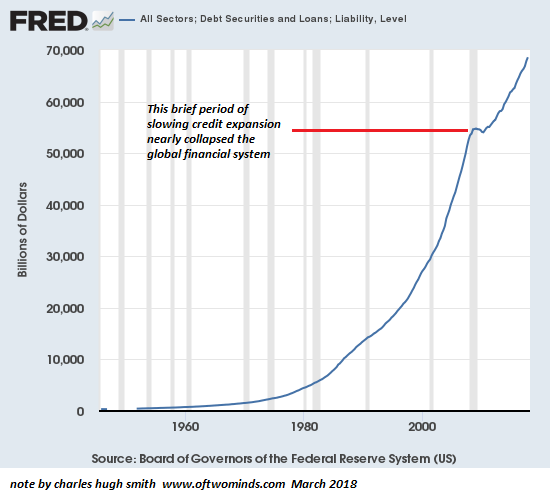 A trillion here and a trillion there, pretty soon you're talking debt levels that insure a devaluation of the currency or a collapse of the entire-debt-dependent system. 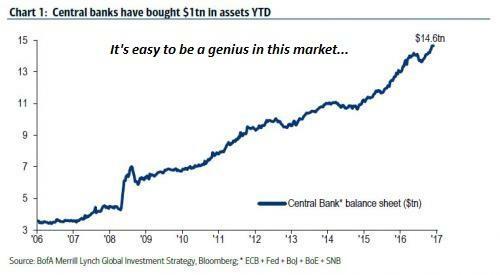 Before we get all giddy about the soaring stock market, let's remember what's been driving it higher--central banks creating trillions out of thin air and using the "free money" to buy stocks and bonds. 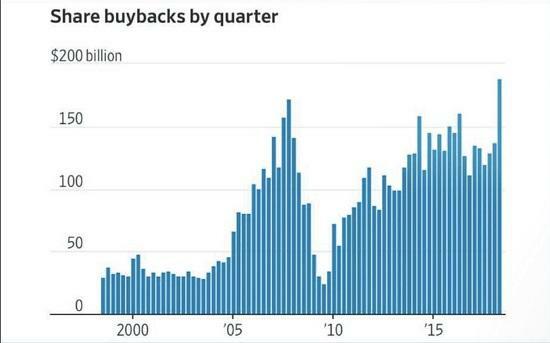 Corporations have been gorging on low-cost debt to fund stock buybacks, which push share prices higher, rewarding insiders and the already-wealthy who own the majority of financial assets. 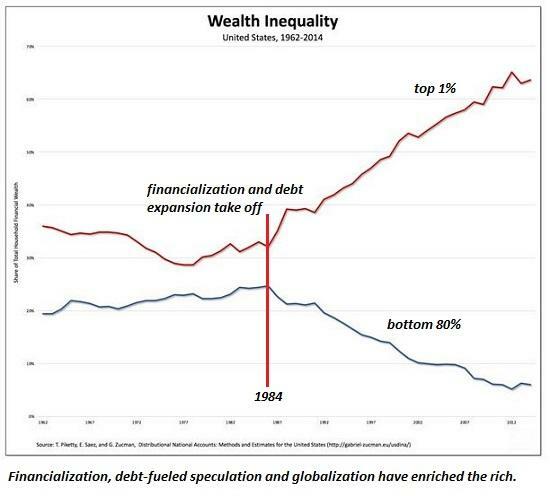 Speaking of insanely destabilizing and unsustainable trajectories--take a look at wealth inequality: the top 1% (actually, the top .5%) have skimmed the vast majority of the past decade's gains, the top 5% have gathered most of the remaining crumbs, the next 15% (between 80% and 95%) have illusory gains solely based on bubble valuations, and the bottom 80% have lost ground. Anyone who thinks exponentially rising debt and staggering wealth/income inequality are stable and sustainable is taking way too much Ibogaine. Magical thinking doesn't actually change reality or make the unsustainable sustainable. These charts reflect a linear system that is wobbling into the first stages of non-linear destabilization. What is unsustainable and unstable will destabilize, slowly at first, and then rapidly as all the buffers creating the illusion of stability give way. Our "wealth" is as illusory as the fantasy that ever-expanding trillions of dollars can be borrowed annually for decades to come, with no consequence. The system collapses if we trim borrowing, and it collapses if we keep borrowing more every year. There is no middle ground, no Goldilocks state where we can borrow just enough to squeak by. That appears possible in a linear system, but once it shifts into non-linear dynamics, that fantasy will quickly be destroyed.